Welcome to Kochi (colonial name Cochin),the gateway to Kerala,also referred to as "the queen of Arabian sea"is a vibrant city situated on the south-west coast of the Indian peninsula in the breathtakingly scenic and prosperous state of Kerala, hailed as 'God's Own Country. Kochi is arguably the ideal starting point for exploring the unfathomable diversity and beauty of Kerala, rated in the top three tourist destinations by the World Travel & Tourism Council and featured in National Geographic Traveler's '50 greatest places of a lifetime'.Cochin is proud to have its world class port and international airport that link it to many major cities worldwide. FORT KOCHI An ideal place for an evening stroll and to watch a spectacular sunset. Other attractions include sampling gourmet seafood, shopping for shawls, carpets, handicrafts, and exotic trinkets; or watching a Kathakali performance, the traditional and brilliantly colourful dance form of Kerala. CHINESE FISHING NETS – These fixed, cantilevered fishing nets, at the entrance of the harbour and along the backwaters, were introduced by traders from the court of Kublai Khan. Records show that they were first erected between AD 1350 and 1450. The best place to watch these nets is from Vasco da Gama square, a narrow promenade that lies parallel to the beach.Strange but, these nets are found only in Kochi, apart from China! WILLINGDON ISLAND is a man made island. The island is made by sand that was dredged while deepening the backwaters for the Cochin Port. It was named after Lord Willingdon who was a former British Viceroy of India This island is the home of the Cochin Port as well as the headquarters of the Southern Naval Command. Today, the island is the site of the city's best hotels and trading centers. The fact that it is surrounded by backwaters makes it a tremendously beautiful location. MATTANCHERRY PALACE or the Dutch Palace is a beautiful palace that was originally built by the Portuguese. It was only during the 17th century that the Dutch took it over, modified it and then presented it to the Raja of Kochi. Because it was gifted y the Dutch hance it started being referred as the Dutch Palace. The coronations of many Rajas of Kochi were held here throughout the years. The main attractions here are the outstanding collection of mural paintings found inside. These murals beautifully depict scenes from the Hindu epics of Mahabharatha and Ramayana. The paintings are colorful and artistic in their representation and are truly remarkable to look at. This Dutch palace is situated on Bolghatty island which is just a short boat ride away from the mainland. The palace has been converted to a hotel run by the Kerala Tourism Development Corporation (KTDC). The island has a tiny golf course and the panoramic views of the port and the harbour, makes it an attractive picnic spot. Frequent boat service is available from the mainland. Cherai Beach is picturesque beach located on the north end of Vypeen Island. This island is one among the several tiny islands that are located just off the shore of the mainland.This 15 km long stretch of beautiful sandy beach is lined by luscious green coconut groves and paddy fields. The combination of white sand, blue water, and green vegetation makes this a wonderful place for . In fact, this beautiful spot is extremely popular with picnickers as well as sun worshippers and beach lovers. 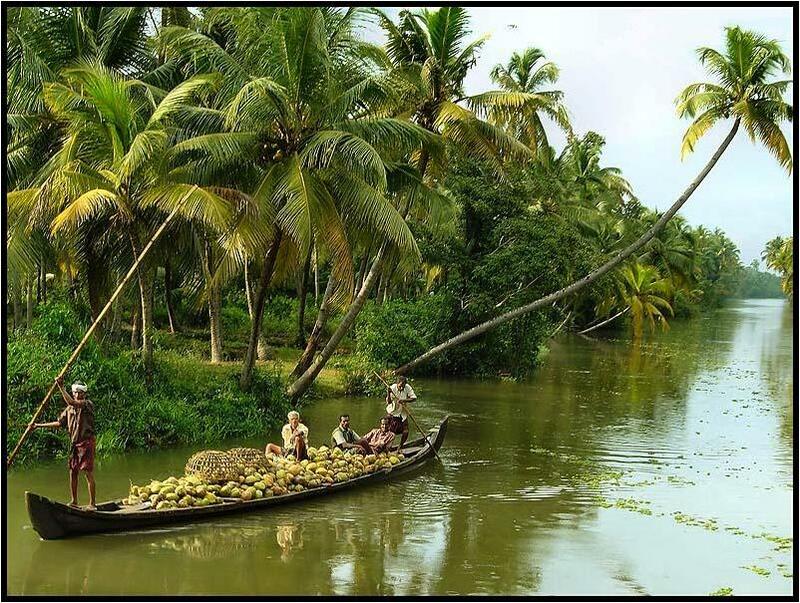 Situated 63 kms south of Cochin along the coast, Alleppey is connected to Kochi by rail and road. It is called the Venice of the East due to the extensive canal network here. Every year the famous snake boat race is held here.Backwaters of Alleppey are world famous and is the most popular tourist attraction in Kerala.Travelers from all over the world come to Kerala to visit this famous backwater destination. Kodanad is 30 kms north-east of Kochi situated on the lower ranges of the Western Ghats on the banks of river Periyar. The wildlife reserve is famous for the elephants and the largest elephant training centre is situated here. The reserve also features a mini zoo. Kodanad is close to St. Thomas church in Malayatoor. Munnar – breathtakingly beautiful – a haven of peace and tranquility – the idyllic tourist destination in God's own country. Set at an altitude of 6000 ft in Idukki district, Munnar was the favored summer resort of the erstwhile British rulers in the colonial days. Unending expanse of tea plantations – pristine valleys and mountains- exotic species of flora and fauna in its wild sanctuaries and forests – aroma of spice scented cool air. yes! Munnar has all these and more. It's the place you would love to visit. About 140 kms from kochi, Munnar is a hill station ideal for a relaxing holiday away from the tropical lowlands. The tea gardens and cardamom plantations give Munnar a beautiful look. Anai Mudi, the highest peak in South India is in these hills. The Munnar – Kodaikanal road is believed to be the steepest road in South-East Asia. India 's largest wildlife sanctuary is a dream destination for any tourist visiting India .Elephants, bisons, antelopes, samburs, monkeys and bears can be found in their natural habitat in this world famous wild life sanctuary, situated 190kms east of Cochin. A boat ride through the man-made lake in the heart of the sanctuary provides a unique opportunity to observe these animals in their natural surroundings.The 120 years old 'Surki' dam built across Peryiar, Poorna in Vedic parlance, is a major tourist attraction. This sanctuary is spread over an area of 777 Sq.Kms, surrounded by an artificial lake over an area of 25 Sq.Kms. “The Smile Centre”,Kochi is a concept of Dr. Prasanth Pillai,an Oral & Maxillofacial Surgeon & Implantologist . With a 3500 sq feet space, it is designed keeping patient comfort and privacy in mind and is located in the heart of Kochi city easily accessible, with excellent ambiance & ample car parking provisions. It has carved a niche as a trendy modern and upmarket dental clinic. Advanced Dento-Facial Services: Facilities to undertake all types of dental and facio-maxillary treatment procedures ranging from routine dental treatment to complex dentofacial surgeries, utilizing modern techniques and equipment. Treatment Planning: Employs digital photography (both intra-oral & extra-oral), radiography and diagnostic casts in treatment planning and execution to achieve excellent results. This includes pre and post treatment records. Record maintenance: Fully computerized and has an excellent record maintenance facility. Unique Dental Implant Services – Immediate Loading Dental Implants using Single Piece Technology introduced by Dr. Ihde Dental, Germany. For more info, visit: www.DentalImplantsKerala.com. We also have an exclusive Dental Implant Centre which offers implant surgery services to reputed and established Dental Centres as well as training to practising Dental Specialists who wish to get trained in the new series of Dental Implants. Clinic Staff: Experienced, well-trained and friendly clinic staff Dental Laboratory: Attached dental laboratory in order to facilitate easy delivery of dental prostheses / appliances – including advanced ceramic dental work. Infection Control Measures: Follows Universal Precautions (safety procedures established by the Centers for Disease Control and Prevention and the American Dental Association). Equipped with all modern equipment required to achieve adequate infection control. Our Associates : Has a good team of experienced doctors (includes Plastic Surgery and Anesthesiology apart from all specialties in Dentistry) & responsible, efficient staff. Treatment costs: are as per norms set by the Indian Dental Association. Credit cards / cheques accepted for payments. Treatment protocol: Patients are treated on appointments only. Patients with dental emergencies and medical problems will be given appointments on short notice. Waste Disposal: Waste disposal of our clinic is carried out by IMAGE, a subsidiary of the Indian Medical Association. We have been following the norms set by the Indian Medical Association as well as Indian Dental Association with regard to waste management. DENTAL & ORO-MAXILLOFACIAL WING,SARAF HOSPITAL,KOCHI. Also have another unit at Saraf Hospital ( www.SarafDental.in), Ravipuram, Kochi with provisions for admission, medical backup and 24 hrs emergency care. Has facility for ample car parking, right in the heart of the city. Dentofacial Esthetic Center (DEC) is a charitable trust catering to patients with facial deformities.DEC is concerned with management of patients requiring correction of dentofacial deformities and defects. It is a registered charitable trust which has provisions to treat patients from the low-socioeconomic background either free or at subsidized treatment charges. Subhash Bose Road., Kadavanthra, Kochi – 20. Why come to Kochi for Dental Treatment? We have the facilities and infrastructure to manage the entire gamut of dental procedures ranging from dental scaling (cleaning), restorations / fillings etc. to highly advanced procedures including Immediate Loading Dental Implants & Facial Cosmetic Surgery. The most relevant fact here is that all these high quality treatment procedures are offered at costs which are almost 1/10th. of the costs which you will incur abroad, that too without any compromise on the quality of the procedures. Certain procedures such as the Immediate Loading dental implants which give you quick dental implant solutions (in certain cases within a matter of 3 days!) are not even available in most countries. Kerala, being an excellent travel destination, apart from receiving world-class dental treatment, you'll also be able to experience Kerala in every way, especially by traveling and staying at exotic locales in between dental treatment procedures. And after all this, you save considerable amount of money… you can never think of a better deal! About Kerala – "God's own Country"
erala, India’s more verdant state, has several unique geographical features which makes it one of the most popular tourist destinations in India. Kerala has been rated by National Geographic Traveler as one of the world's 50 must-see destinations in the world. The lush flora of Kerala is very distinctive. The word Kerala has been derived from the term “Keralam” in the native Malayalam language, meaning, “Land of the coconut palm trees”. Kerala is fondly called “God’s own Country” as it is blessed with the bounty of nature in its pristine best, rich traditions and culture and myriad art forms. Washed by a 600 kilometre long coastline and carpeted by some of the last remaining stretches of tropical evergreen rainforests, Kerala is also blessed by a unique network of backwaters that criss-cross the picture book villages and cooled by mist-clad hill stations and spice gardens that stretch endlessly.